Synopsis: Arjun (Shiv Pandit) come to Mumbai to visit his fiancee Maya. He reaches the City court to meet her and is taken aback when he is not able to find her anywhere. He begins to search for Maya and in an unexpected turn witnesses an unlikely murder. Frantic and exasperated, he is left with no choice but take passerby’s as hostages before he is framed as the killer. The cops try to tackle the situation and within no time realize that Arjun is no ordinary hostage-taker and it seems next to impossible to apprehend him. 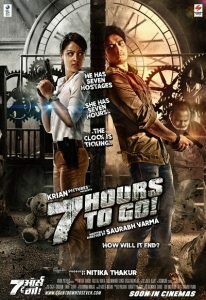 Now, with nothing to lose, Arjun lays down his terms: “I have 7 hostages! And I am giving the Police 7 hours to find out the killer…! I need progress every 60 minutes or one hostage dies every hour! !” The clock ticks and the investigation begins.